Plaza de la Quintana is one of the largest squares in Santiago. 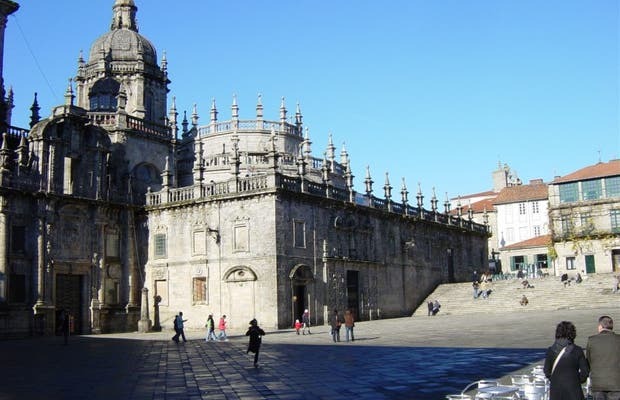 It is also important because it is behind the Cathedral of Santiago (east gate) and has the entrance to SANTA DOOR, which is only opened in the Jacobean years (any year where July 25th falls on a Sunday). One of my favorite things about this place is its austerity and its stairway, where many pilgrims and tourists stop to rest and it is always filled with all kinds of people, including many hippies and world travellers. Another great thing is to hear the chimes of the cathedral at dusk. The Clock Tower which containing the bell Berengaria is very close, and whenever it chimes it can be heard echoing in this square.